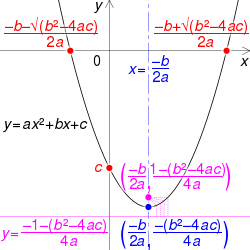 This article is about single-variable quadratic equations and their solutions. 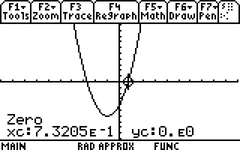 For more general information about the single-variable case, see Quadratic function. 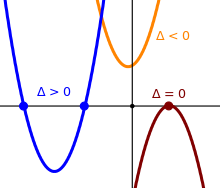 For the case of more than one variable, see Conic section and Quadratic form. One property of this form is that it yields one valid root when a = 0, while the other root contains division by zero, because when a = 0, the quadratic equation becomes a linear equation, which has one root. By contrast, in this case the more common formula has division by zero in both cases. 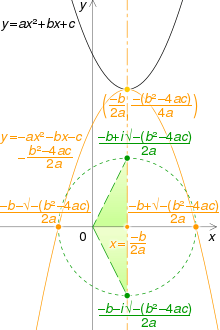 Visualisation of the complex roots of y = ax² + bx + c : the parabola is rotated 180° about its vertex (yellow). 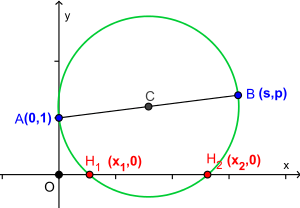 Its x-intercepts are rotated 90° around their mid-point, and the Cartesian plane is interpreted as the complex plane (green). Find the square root using a table of squares. Geometric methods were used to solve quadratic equations in Babylonia, Egypt, Greece, China, and India. The Egyptian Berlin Papyrus, dating back to the Middle Kingdom (2050 BC to 1650 BC), contains the solution to a two-term quadratic equation. In the Indian Sulba Sutras, circa 8th century BC, quadratic equations of the form ax2 = c and ax2 + bx = c were explored using geometric methods. Babylonian mathematicians from circa 400 BC and Chinese mathematicians from circa 200 BC used geometric methods of dissection to solve quadratic equations with positive roots. Rules for quadratic equations were given in the The Nine Chapters on the Mathematical Art, a Chinese treatise on mathematics. These early geometric methods do not appear to have had a general formula. Euclid, the Greek mathematician, produced a more abstract geometrical method around 300 BC. 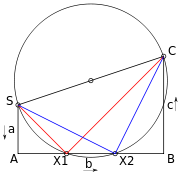 With a purely geometric approach Pythagoras and Euclid created a general procedure to find solutions of the quadratic equation. In his work Arithmetica, the Greek mathematician Diophantus solved the quadratic equation, but giving only one root, even when both roots were positive. The Bakhshali Manuscript written in India in the 7th century AD contained an algebraic formula for solving quadratic equations, as well as quadratic indeterminate equations (originally of type ax/c = y Muhammad ibn Musa al-Khwarizmi (Persia, 9th century), inspired by Brahmagupta, developed a set of formulas that worked for positive solutions. Al-Khwarizmi goes further in providing a full solution to the general quadratic equation, accepting one or two numerical answers for every quadratic equation, while providing geometric proofs in the process. He also described the method of completing the square and recognized that the discriminant must be positive,:230 which was proven by his contemporary 'Abd al-Hamīd ibn Turk (Central Asia, 9th century) who gave geometric figures to prove that if the discriminant is negative, a quadratic equation has no solution. :234 While al-Khwarizmi himself did not accept negative solutions, later Islamic mathematicians that succeeded him accepted negative solutions,:191 as well as irrational numbers as solutions. Abū Kāmil Shujā ibn Aslam (Egypt, 10th century) in particular was the first to accept irrational numbers (often in the form of a square root, cube root or fourth root) as solutions to quadratic equations or as coefficients in an equation. The 9th century Indian mathematician Sridhara wrote down rules for solving quadratic equations. ↑ "Complex Roots Made Visible -- Math Fun Facts". Retrieved 1 October 2016. 1 2 3 4 Katz, V. J.; Barton, B. (2006). "Stages in the History of Algebra with Implications for Teaching". Educational Studies in Mathematics. 66 (2): 185–201. doi:10.1007/s10649-006-9023-7. 1 2 Boyer, Carl B.; Uta C. Merzbach, rev. editor (1991). A History of Mathematics. John Wiley & Sons, Inc. ISBN 0-471-54397-7.